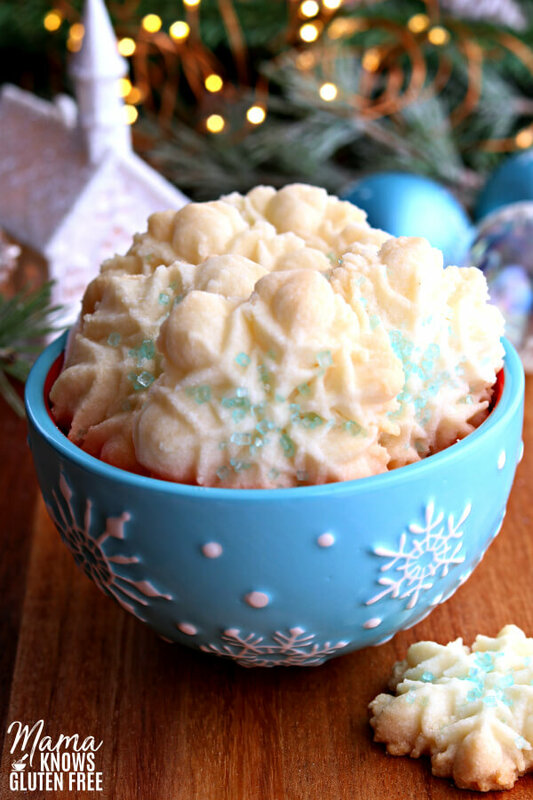 Almond spritz cookies are the perfect balance of a bit of almond and touch of sweetness. This light and a perfectly crisp cookie is a Christmas cookie classic. It now can be enjoyed both gluten-free and dairy-free. Recipe originally published in November 2017, photos updated November 2018. 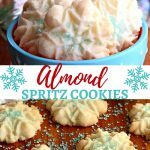 Almond spritz cookies have been my favorite Christmas cookies since childhood. My mom is a big holiday baker and she bakes serval types of Christmas cookies. In her holiday cookie line up there were always almond spritz cookies. I love the simplicity of these cookies. 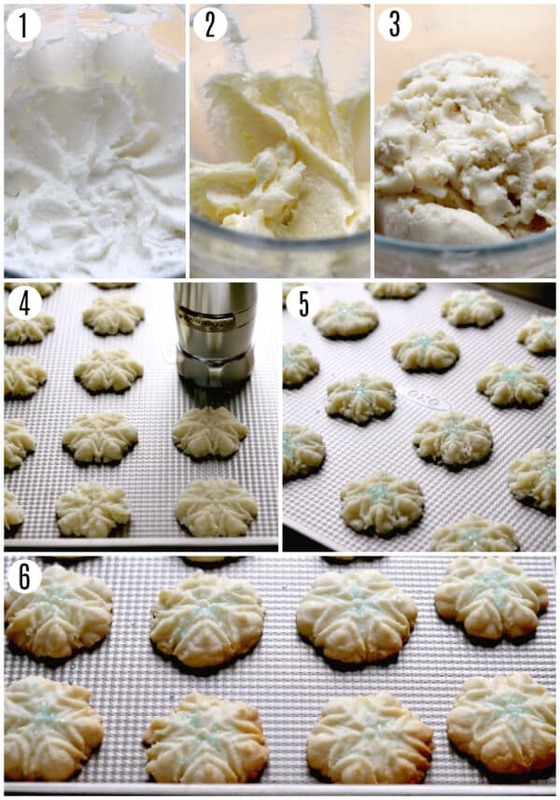 Spritz cookies are similar to butter cookies, but this recipe is dairy-free, so it’s not made with butter. They are not too sweet and are perfectly crisp. When I starting having kids, my mom passed down her little cookie recipe book from her original Mirro Cookie Press, so I could make my beloved spritz cookies for my family. I made them for years and my family loves them as much as I do. So when I had to start eating gluten-free I thought I would no longer be able to make my favorite Christmas cookies. As I got more confident with my gluten-free baking I decided to try and modify my Mom’s recipe. I went out and bought a new cookie press and set out to make gluten-free almond spritz cookies. Preheat your oven to oven to 375 °. powder and give it a stir to blend ingredients. Enjoy! Store in an air-tight container. 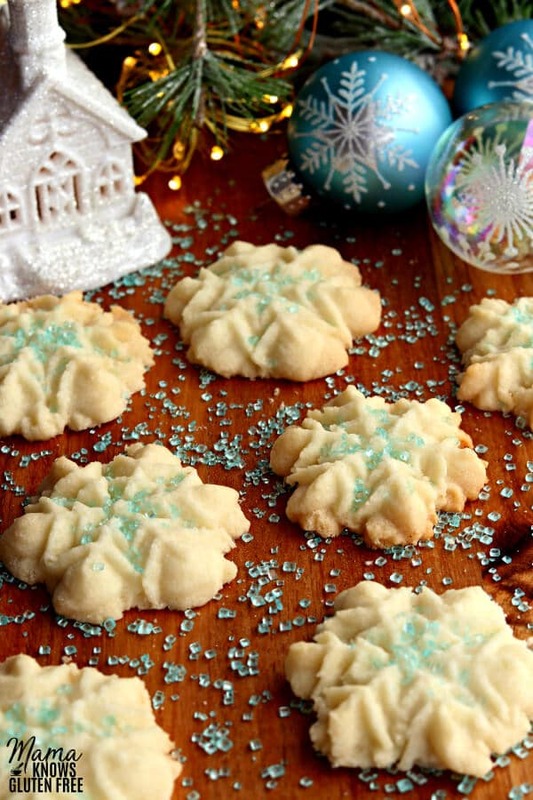 These cookies are not just for Christmas! I made these cookies using a flower disk for a friend’s wedding reception. These spritz cookies are perfect for weddings, bridal or baby showers! These gluten-free spritz cookies are also dairy-free. My husband, myself and youngest son are all dairy-free as well. Using shortening makes this recipe dairy-free. I have never tried this recipe with butter. So, now you too can enjoy a gluten-free and dairy-free spritz cookie. I promise that it is just as delicious dairy-free butter. I can’t tell you how happy I was when these little beauties came out of the oven! There is nothing like being able to have one of your favorites recipes turn out just like you remembered even though they are now gluten-free. These addictive little almond cookies are sure to be a favorite with your family too! Recipe adapted from Mirro Cookie Press booklet. Hi Vicky! Yes I did use Crisco for the shortening. 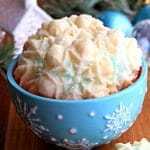 This is my all-time favorite Christmas cookie recipe! Hi Carol! I have never used butter. It may not have the same moisture that the shorting has. If you want a more butter flavor you could use butter flavored shorting, but your cookies won’t be as white. Hi Rozalyn! The recipe will make 4-5 dozen cookies. Is a cookie press necessary? Can the dough be dropped then pressed perhaps? Hi Lois! No a cookie press is not necessary. I have made them like regular cookies. I rolled them into a ball and then pressed them down. They were still super tasty. Thanks for asking! Could you use coconut oil for the shortening? Hi Rebecca. I have not tried coconut oil. A good substitute would be palm shortening. I’m not sure if the coconut oil would give it enough moisture. I use coconut oil instead of butter all of the time, but I have not tried it in this recipe. If you try it, please let me know how they turned out. Have you tried them egg free? Hi Cynthia! I have not tried them egg free. If you try them egg free please let me know how they turned out. Thank you for asking. So glad we found this recipe! These are as delicious as my grandmothers but safe for my children to eat! And so easy to follow the directions! 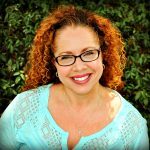 Hi Dana, thank you so much for the wonderful recipe review! These are my favorite cookies since childhood. I am so happy that you enjoyed them and they remind you of your grandmother’s cookies. That’s a big deal to me! I am also glad that you found the recipe easy to follow. Thanks again! These are so good!! I usually like to follow the recipe exactly and then review, but I don’t eat shortening so I planned to use butter. When I got to the butter I realized that I only had 3/4 cup, so I had to use 1/2 cup of coconut oil and 3/4 cup butter haha. Happy to report that they came out perfectly and I can’t imagine that they could get any better than this! Thank you Cayla for the wonderful 5-star recipe review! I am so happy that you enjoyed the spritz cookies. I am glad that the butter and the coconut oil worked well with the recipe. I have always made them with the shortening (like my Mom makes them). I’ll have to try it with the butter or the Smart Balance butter sometime. Thank you again!